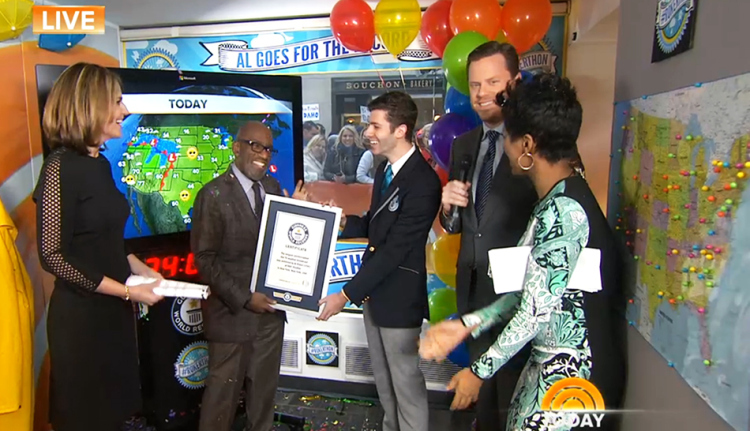 America’s favorite weatherman, or at least the “Today Show’s”, Al Roker set a Guinness Book world record of longest televised weather report. Roker made history by giving weather reports for 34 hours, not counting the five-minute breaks his bladder no doubt needed, on NBCNews.com. He did it to raise awareness for the USO, which he honored last month with his planned “Today”/USO Comedy Tour. Roker envisioned a Bob Hope style show to entertain the troops, and lo and behold Jay Leno, Craig Robinson, lliza Schlesinger and Kevin Eubanks shared his mission and made our biggest heroes laugh. With the weatherman’s latest show of support the USO is counting the more than $70,000 Roker raised through his Crowdrise page. He asked America–through his marathon coverage of the nation’s polar vortex–to support the org. And that they did by not only opening their wallets, but also keeping Roker’s world record goal a hot topic on twitter: #Rokerthon. How is that to cap off Veteran’s week?